Antineutrino reactor monitoring has been proposed in the 1970s; steady progress in detector technology will make this technology practically feasible within 1-2 years. In this contribution we investigate how this decades-old idea can be applied to the recent situation in Iran, more specifically we discuss the benefits of using antineutrinos to monitor the heavy water reactor at Arak, the IR-40. One of the key findings is that a detector situated outside the reactor building would meet the verification goals identified by the International Atomic Energy Agency for plutonium production or diversion from declared inventories. All nuclear reactors produce plutonium during operation, however only very specific types of reactors are suitable for the production of weapons-grade plutonium. Historically, all plutonium used in nuclear weapons has been obtained from either heavy water or graphite moderated reactors fueled with natural uranium. At the beginning of their respective weapons programs these reactors typically had a thermal power output in the 20-250 MWth range, which is considerably less than typical commercial power reactors. As shown in previous work [1,2] reactors with a power output in this range represent a particularly suitable target for antineutrino reactor monitoring. Iran is constructing a 40 MWth heavy water moderated, natural uranium fueled reactor at Arak, the so-called IR-40. Given its design characteristics, this reactor is ideally suited to make weapons-usable plutonium with an annual output of about 10 kg. It is estimated that about 4 kg of plutonium are sufficient to make a simple explosive device with a yield upwards of several kilotons of TNT equivalent . Iran states that the IR-40 will be used exclusively for peaceful purposes, in particular isotope production for medical applications. Nonetheless, the IR-40 is, after the uranium enrichment program, one of the key issues in the ongoing negotiations between Iran and the P5+1 countries (i.e., these are the five permanent members of the UN Security Council: United States, Russia, China, United Kingdom, France plus Germany). A possible solution could be the conversion of the reactor to operate with enriched uranium reducing its plutonium output significantly without limiting its ability to provide isotopes for civilian applications . Any agreement reached about the the future of the IR-40 will present a challenge for effectively monitoring its implementation. The historic example of the first nuclear crisis in the Democratic People's Republic of Korea (DPRK) in the 1990's serves as a stark reminder that providing reliable safeguards and timely warning of possible breaches is very difficult in a host country which is not deterred by international isolation. In the DPRK example the consequences were intermittent, but critically timed, denials of inspector access at the required level and ultimately, this allowed the DPRK to further its nuclear weapons capabilities while negotiating for an end of the plutonium program . Antineutrino monitoring was proposed in the late 1970s by Borovoi and Mikaelyan . The number of antineutrinos produced and their energy spectrum depends in a well-defined manner on the reactor power and on the relative contribution to fission from the various fissile isotopes. Thus a careful measurement of both the number of antineutrinos and their energy distribution allows, in principle, to infer the reactor power and the amount of plutonium in the core. Plutonium production is an inevitable result of reactor operation and thus in itself not indicative of any malfeasance. A quantitative indicator for a diversion of plutonium is a mismatch between the amount of plutonium produced by a reactor core and the amount of plutonium residing in the reactor core. Neither of these two quantities is easily measured directly and thus, suitable proxies are used: the reactor's power history provides a means to compute the amount of plutonium produced whereas a detailed history of reactor fueling allows to track the in-core plutonium content. Both indicators rely on a complete, uninterrupted data record -- should there be any loss of this so-called continuity of knowledge (CoK), the ability to determine any mismatch between produced and in-core plutonium is lost; any recovery is difficult and may be only partial. We argue that antineutrino monitoring could provide a robust and non-intrusive method to recover from a loss of the CoK. Specifically, we consider a hypothetical IR-40 case which to some extent draws on the experience with the DPRK: There is full safeguards access for N-1 months. The reactor is shut down in the Nth month and at the same time the CoK is lost. The reasons for loss of the CoK can span a wide range from merely technical issues, to a diplomatic standoff, to an attempt at proliferation. The basic question arising in this scenario is: Was the reactor refueled or not? Obviously, finding an answer in a timely fashion would be of prime interest to the international community and in many cases also be in the best of Iran's interests. In our earlier work  we demonstrated quantitatively that a measurement of the energy spectrum of antineutrinos emitted from a reactor makes it possible to determine the burn-up and, thus, the plutonium content with good accuracy and in a timely manner. Here, we make the same assumptions as in Refs. [1,2] about the detection system, we assume that product of efficiency and number of target protons is 4.3 X 1029, which for a realistic detector translates to a detector mass in the 5-15 ton range. This is still light enough to envisage a detector system which fits inside a standard 20 feet intermodal shipping container. Furthermore, we assume sufficient background rejection capabilities to allow for surface operation. For a long time this was considered not possible for antineutrino detectors, but recently a Japanese group succeeded in the detection of reactor antineutrinos from the back of a van . Nonetheless, we have to point out that at this point in time no detector system with all the required characteristics exists. At the same time, there are about a dozen collaborations world-wide attempting to produce suitable detectors (for a different purpose) and it seems very likely that fully functional prototypes will demonstrate feasibility within 12 months. In our estimate, a detector inside its shipping container can be deployed outside the reactor containment building of the IR-40 at a distance of 19 m from the center of the reactor core. Figure 1: In the upper panel, data points show the event rate spectrum obtained in a 90 day data taking period for a core of average age of 45 days. The error bars indicate the statistical error in each bin. The blue line indicates the corresponding expected event rate spectrum for a core of average age of 315 days. 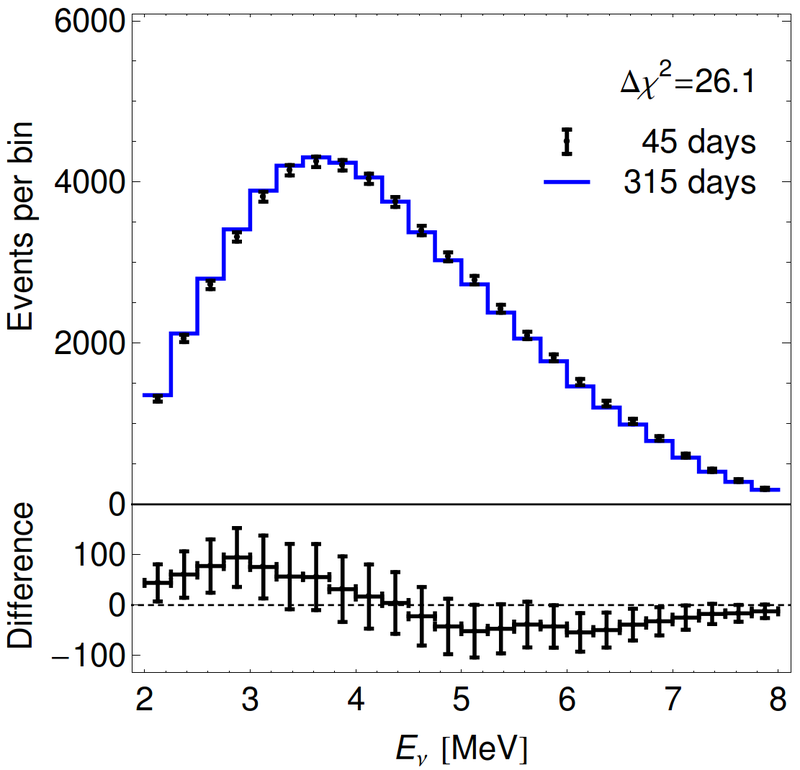 The lower panel shows the difference in event rates between the 45 day core and the 315 day core and the corresponding statistical error bars. Figure and caption from Ref..
Our analysis of the IR-40 is using standard reactor physics calculations made using commercially available software and the details are given in Ref.. This calculation establishes the relationship between the fission rates and the content of the fissile isotopes in the core. In Fig.1 we show the resulting event rate spectrum for a core of 45 day average age (data points with statistical error bars) and for comparison the expected event rates for a core of 315 days of age (blue line). It can be seen clearly, that the older core emits neutrinos with a lower mean energy corresponding to 7 kg of plutonium, whereas the fresh core has no plutonium. This difference remains statistically significant even in the presence of realistic systematic uncertainties. Figure 2: Shown is the 1σ accuracy for the determination of the plutonium content of the reactor as a function of time in the reactor cycle. The data-taking period is 90 days each. Dashed error bars indicate the accuracy from a fit to the plutonium fission rate fPu, whereas the solid error bars show the result of a fit constrained by a burn-up model. The blue line indicates operation without refueling and the orange line indicates operation with a refueling after 270 days. Figure and caption from Ref.. 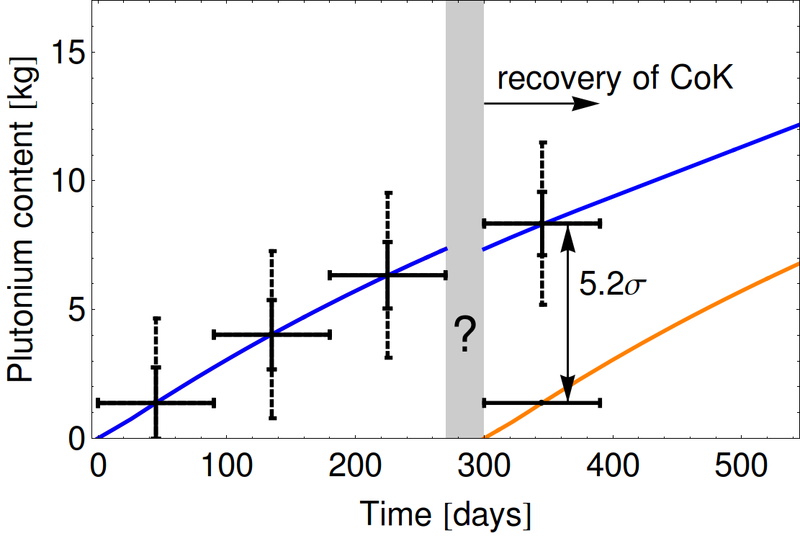 The quantitative sensitivity to the plutonium content is shown in Fig.2, where the vertical axis shows the amount of plutonium in the reactor core as a function of time. The blue curve shows the change of plutonium content for the case of no refueling, whereas the orange curve assumes that the irradiated core, containing 8\,kg of plutonium, was replaced with a fresh core after 270 days of irradiation. 270 days is the time at which the isotopic content of plutonium-239  drops to 93% of all plutonium and thus formally ceases to be considered weapons-grade. Within the first 90 days after the IR-40 shutdown (shown as gray vertical band) the two cases can be clearly distinguished by the antineutrino monitoring data. Even partial core refuelings corresponding to as little as 2 kg of removed plutonium could be detected at 90% confidence level. Alternatively, a full core refueling would be detected within about 9 days at 90% confidence level. To summarize, in this note, based on the results of Ref. we demonstrate that antineutrino monitoring of the IR-40 would provide a high-level tool to assess the amount of in-core plutonium as well as the amount of produced plutonium. Both tasks can be accomplished withing the 90 day period set by the International Atomic Energy Agency (IAEA) and with a quantitative accuracy greatly exceeding 1 significant quantity (8 kg) as required by the IAEA. This technique is non-intrusive and independent from any other safeguards information, in particular the CoK is not required. This combination of features appears to be a considerable and practically valuable characteristic not offered by any other known method. Needless to say, these advantages would not only arise for antineutrino monitoring of the IR-40 but for any reactor with a power output in the 20-250 MWth range, which are the most likely candidates for being an entry point for a plutonium-based nuclear weapons program. Antineutrino reactor monitoring would not replace other techniques but in combination with those techniques can enhance the overall effectiveness and reliability of non-proliferation safeguards. A practical system appears feasible on a timescale of 1-2 years and the next step would be an actual antineutrino reactor monitoring experiment. This work was supported by the U.S. Department of Energy under contract DE-SC0003915 and by a Global Issues Initiative grant by the Institute for Society, Culture and Environment at Virginia Tech. Eric Christensen, Patrick Huber, Patrick Jaffke, "Antineutrino reactor safeguards - a case study". arXiv:1312.1959v2 [physics.ins-det] (2013). Eric Christensen, Patrick Huber, Patrick Jaffke, Thomas E. Shea, "Antineutrino Monitoring for Heavy Water Reactors". Physical Review Letters, 113, 042503 (2014). Abstract. T. B. Cochran and C. E. Paine, Technical Report, Natural Resources Defense Council, Inc. (1995). O. Heinonen, "Can the Nuclear Talks With Iran Be Saved?" Foreign Policy, 1 (January 27, 2011). Full Article. J. S. Wit, D. Poneman, and R. L. Gallucci, "Going Critical: The First North Korean Nuclear Crisis" (Brookings Institution Press, 2007). A. A. Borovoi, L. A. Mikaélyan, "Possibilities of the practical use of neutrinos". Soviet Atomic Energy, 44, 589 (1978). Link. S. Oguri, Y. Kuroda, Y. Kato, R. Nakata, Y. Inoue, C. Ito, M. Minowa, "Reactor antineutrino monitoring with a plastic scintillator array as a new safeguards method". Nuclear Instruments and Methods in Physics Research Section A: Accelerators, Spectrometers, Detectors and Associated Equipment, 757, 33 (2014). Abstract. Thomas Mo Willig, Cecilia Futsaether, Halvor Kippe, "Converting the Iranian Heavy Water Reactor IR-40 to a More Proliferation-Resistant Reactor". Science and Global Security, 20, 97 (2012). Full Article.